ScholarBlog is the blog for Scholar@UC — the UC digital repository, part of the UC Research Hub. UC Libraries support digital scholarship by curating digital collections, managing a next generation repository, offering state of the art digital laboratories, and more. UC Libraries data management services help you write your data plan, document, share, store your data, and connect with library staff who can assist you. 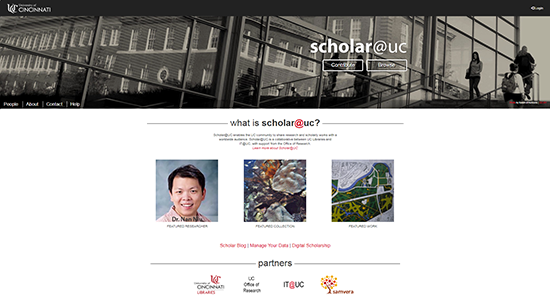 Scholar@UC is an open source, agile development project supported by the University of Cincinnati Libraries and IT@UC with support from the Office of Research.